Benjamin Weaver is an outsider in eighteenth-century London: A Jew among Christians; a ruffian among aristocrats; a retired pugilist who, hired by London’s gentry, travels through the criminal underworld in pursuit of debtors and thieves. 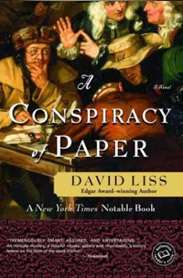 In A Conspiracy of Paper, Weaver becomes entangled with a crime of the most personal sort, involving the mysterious death of his estranged father, a notorious stock-jobber. their business dealings with an intricate web of deception and violence. The more Weaver discovers, the darker the truth becomes, until he realizes that he is following too closely in his father’s footsteps–and they just might lead to his own grave. Relying on brains and brawn, Weaver uncovers the beginnings of a strange new economic order based on stock speculation – a way of life that poses great risks for investors, but real dangers for Weaver and his family.